We know you loved (or might still love) zipping down the slide as a kiddo. Even better? When it dropped you off into a pool. Remember those? We found one we couldn’t have dreamed up – an ultra-long extremely thrilling ride – through the jungle! The Buena Vista Lodge, in the Rincon de la Vieja National Park in Guanacaste, offers the uniquely exciting and wild outdoor experience of a jungle water slide. As if the waterslide alone isn’t enough to tempt us! After a hike up a rainforest mountain, you peel off your outer layers and avail yourself of protective gear like a helmet and an inner tube. Then sit back, and GO! Down 1,356 feet, through the only slide in the country that takes you directly through the jungle. You’ll slide your way down a volcanic mud tube, through the middle of the rainforest on a ride that’s literally miles away from any idea of water park you may have had. Now that’s a serious upgrade to some kid-style fun! However, we understand you may not be able to get to Costa Rica in 2016 or even 2017. 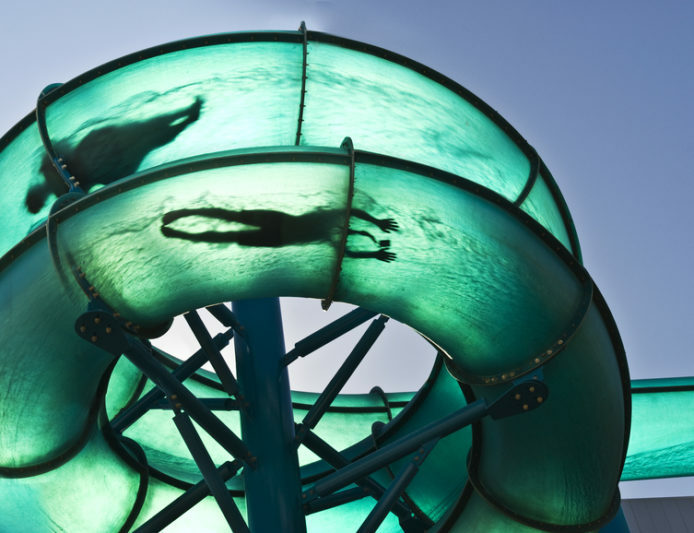 That’s why we’ve also rounded up a few crazy-fun waterslides to get your kid on in the States.